A while back I wrote a blog post on the Model Railroad Hobbyist forum about resurrecting old rolling stock kits developed in the ‘80s, back when the hobby finally began to move past the ‘blue-box’ era. Over the course of that decade, companies like Robin’s Rails, McKean, C&BT, Front Range and Innovative Model Works had sprung up to challenge Athearn and MDC. This was a big leap forward for HO modellers; as these kits were based on specific prototypes, were well researched, and offered a core model with all details applied separately. Since those times we’ve moved into a model railway world of ready-to-run (RTR) pre-assembled models of exquisite quality. New manufacturers like Tangent, ExactRail, Scale Trains and Moloco (just to name a few) now offer 1:87 rolling stock replicas that truly are museum-quality models. However for those who crave the days when we used to build our models, and paid less than $10 for a freight car in the process, there is something to be said for resurrecting these old kits. My latest example is this old McKean 40ft PS-1 boxcar painted for the Louisville & Nashville RR. A good friend and fellow WRMC member had this kit for sale amongst a pile of surplus model train stuff at a previous Kitchener Train Show. It went through two shows without anyone showing interest. What struck me was its 1960s paint scheme, a relative minority in a model railroad world where the popularity of the ‘40s-‘50s transition era dominates how manufacturers paint their products. However it was dismissed at the time due to it being a southeastern US boxcar, which I assumed would be a rare traffic event over the CP Sudbury Division in the 1970s. My thoughts changed recently in my continuing efforts to update the club’s traffic/waybill system. It turns out the southeast US offers northern Ontario a lot more than just orange juice and kaolin. Using the OPSIG Industry Database I’ve found a long list of products that one could see routed through the Sudbury Division which are mainly supplied by the southern states. Cotton, rice, peanuts, casting sand and even mining equipment are just a few of the commodities that were uncovered over a couple of hours of research and coffee consumption. 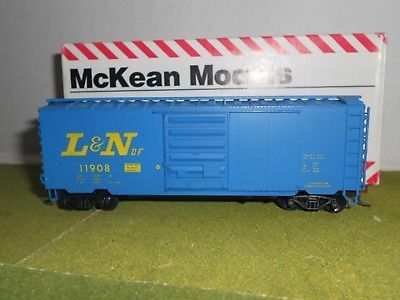 So it turns out the WRMRC had been neglecting a traffic source, and this L&N boxcar was resurrected from the flea market table. This photo shows it fresh from the ‘grunge factory’ (a.k.a. – the spray booth) after all paint, extra decals and final weathering had been applied; along with one of the prototype photos used to aid in its kitbashing. As described in the MRH blog, you pretty much have to throw away all the kit-supplied detail parts. I used better ones which are stuffed away in my surplus parts boxes. The underbody was completely gutted, and replaced with Intermountain underbody details – yes, they sell their detail parts separately. The brake detail on the ‘B’ end was fabricated from brass wire, a brake wheel and housing I had lying around, a bit of photo-etched roofwalk material, and a couple of staples I re-bent to hold the brake platform. Likewise I used staples as stirrups to replace the crude ones supplied by McKean. It should also be noted I used the internet to research these cars, in order to find as many prototype photos as possible. 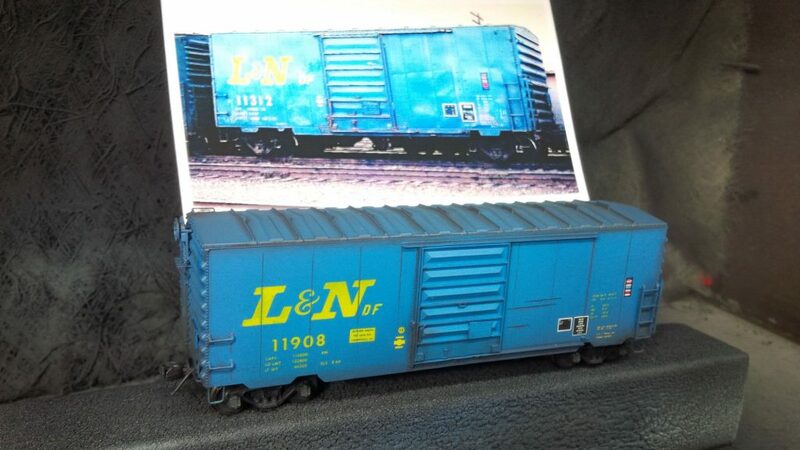 Turns out the L&N 11xxx-12xxx series cars were 1960s rebuilds, with DF loaders, moveable bulkheads and other features added for specified commodities. However with more modern 50-foot cars being purchased, I’m certain that by the 1970s these cars were already relegated back to general service by the L&N. Though it took a few evenings worth of kit-bashing and research, these efforts are what make the hobby rewarding for me. As the price of RTR models continue to climb, I hope more modellers come to discover these old kits from the ‘80s. There is real value to be found here, and you don’t need to dig too deep to uncover them at any train show.